This program guidance provides the concepts, history, precepts and purpose of high occupancy vehicle (HOV) lanes, as well to explain what authority is delegated to "public authorities" over HOV lanes. (The term "public authorities" is defined in Chapter III.) The authority is based on legacy legislation originally set forth in Title 23 Section 166 "HOV Facilities" and most recently amended by the legislation "Fixing America's Surface Transportation Act" (FAST Act) signed into law on December 4, 2015 by President Barack Obama. Picture showing a 2-lane dedicated HOV facility in the median of a highway. The purpose of this document is to provide information useful to States as they plan, design, operate, and manage HOV and HOT facilities. It is intended to be non-binding and should not be construed as a rule of general applicability. This document provides examples for States to follow in evaluating proposed significant changes to the operation of an HOV lane, to include conversion of an HOV lane to a High Occupancy Toll (HOT) lane. 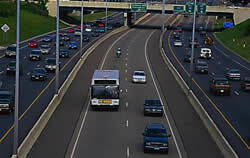 The FHWA supports HOV lanes as a cost-effective and environmentally friendly option to help move people along congested urban and suburban routes. As such, FHWA regulations at 23 C.F.R. 810.102 specifically provide that HOV lanes are eligible for Federal-aid participation. In locations where existing or anticipated excess HOV lane capacity is available, conversion to a HOT lane facility is encouraged as a way to increase throughput and to provide additional travel options for drivers. As part of an overall approach to respond to increased travel demand and address traffic congestion, HOV and HOT lanes can be a practical alternative to adding more general-purpose travel lanes. The FHWA encourages the implementation of HOV or HOT lanes as an important part of an area-wide approach to help metropolitan areas address their requirements for improved mobility, safety, and productivity, while also being sensitive to environmental and quality of life issues.